What would summer be like without a a trip to the frozen custard stand? Perhaps they need to change the name from “Red Hen” to “Blue Hen” if they’re so fearful of people who hold different political beliefs. By now you’ve probably heard about the owner of the Red Hen asking Sarah Sanders to leave because Sarah works for the President of the United States. As a business owner myself, I am shocked by the behavior of this business owner. Sarah Sanders was not asking to make a political speech. She was not asking to use the restaurant for a political fundraiser. She was not attempting to get the staff or other patrons to support Donald Trump. She was just coming as a paying customer. Most of you know that Barack Obama and I don’t share many political values. However, if he came into my Back to Basics Christian Bookstore, I would be honored. If he brought his family, picked up some books and made a purchase, I would be thrilled! As a retailer, we like it when people support our store. One of my fellow retailers told me as long as their money is green, that’s the only color that matters. Sarah Sanders was right to leave the restaurant and even offered to pay for the food they had already been served. Reports were that the restaurant owner was polite, but is it possible to be polite while being rude??? The hate from the left is real. Sarah needed to leave for her safety. If the wait staff and owner were that hostile, should Sarah be concerned they might contaminate her food by spitting on it or doing something that could make her sick? We may never know how far down people will go once they begin the descent. I’m happy Sarah is giving this Country many lessons on how to be brave in the face of adversity. Her courage and class in the face of so many mean-spirited hateful people serves as a model of decency and shows us how to respond correctly. It seems like the left is trying to divide and stir up as much dissension as possible. Why can’t we all just get along? What do you think of the direction we’re heading? 2.) On today’s show we interview a former Air Force B-2 Bomber pilot, Tony Monetti. 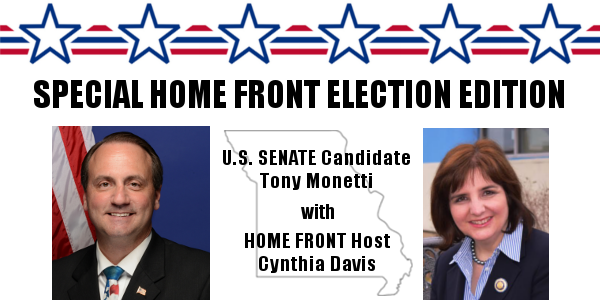 Tony is running for the US Senate nomination and has some ideas to share with us about hot to make our Country strong and safe for all. I enjoyed your commentary on the Red Hen issue. 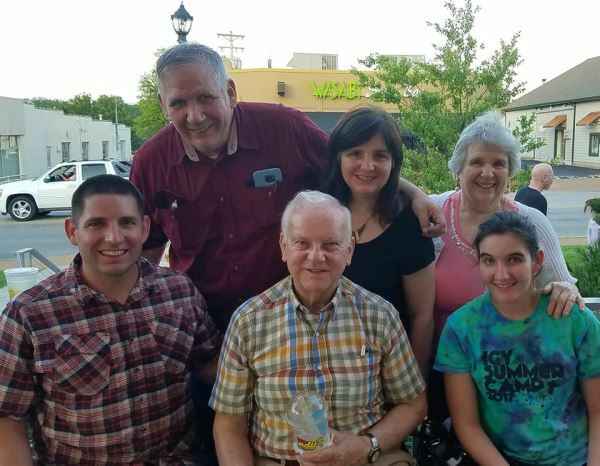 I live about 45 minutes away and visit children and grandchildren that live right in Lexington. I have notified the tourism bureau, that the owner of the Red Hen is the President of, that when visiting VMI, Southern Va University, and my children, our business will go across the border to Rockbridge County outside the City of Lexington borders. The reason I took this stand is that they held a meeting last night and didn’t see anything wrong in what she did. By the way, the national news is also not reporting that the Red Hen owner and employees followed Saunders family to another restaurant and harassed them there also. Very sad. I guess they took Maxine Waters’s call for violence seriously. Good thing the Red Hen is not a bakery or you might agree with their decision on who they can serve. I actually saw that as a different situation. My understanding is they were not unwelcomed in the Bakery and could buy any products that they desired. I believe the issue was that the Baker did not want to make a custom, gay themed, cake and cater it to their wedding. I see that as a different situation. However, having said that, if I was the Bakery, I would probably have just made the cake following the premise Cynthia Davis mentioned that business is business and a customer is a customer. I think you are exactly right Cynthia! 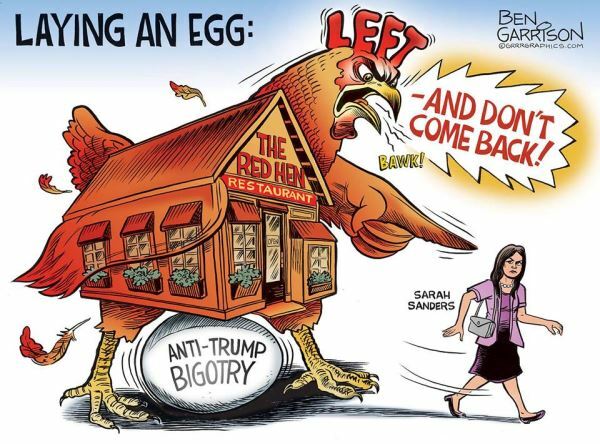 Mrs. Sanders was so classy in her response to the bigoted and hate-filled treatment she received at Red Hen and we should use her as a role model in how we react to verbal assaults by the left. Physical assaults are an entirely different matter; they should be met by the necessary force needed to subdue the aggressor. I like the advice that conservative actor James Woods gives us: 1) buy a gun; 2) vote. He means of course that we need to have the ability to defend ourselves, family and property if assaulted to the degree necessary to ensure safety and that we should vote for good conservative candidates. We are headed down a very Bad Road, and unless the American people wake up, I am not sure of our hope for a very good future. One major problem, is our “Church People” need to wake up now and better yet, all the “so called, Pastors” of the church today. You nailed it again. You are on the right track! Last time I looked, the GOP still controlled the House. Why doesn’t some Republican step forward and offer a bill to censure Maxine Waters for unseemly, provocative and dangerous behavior? Why doesn’t someone from the GOP censure President Trump? We are fighting a spiritual battle and it seems that Satan is becoming more bold in the political arena. It may be that we are more passive in the Christian realm or that we are nearing a return of Christ and Satan feels he has little time. If the issue is that we are move passive in the Christian community then we must learn to fight appropriately. I think many Christians are as nearly existential and tolerant as the left. That will need to change. Sarah Saunders did not comment on the incident on her Twitter account until the people from the resturant, particularly one waiter, made it public. I have no problem with Sarah commenting on it after it was in the public arena when inquiries were being made about what happened.